Tanama Jungle Ranch opened July 1st in Punta Cana, DR. The ranch will offer porting cruise passengers and tourists of Punta Cana an opportunity to experience the beautiful nature of the surrounding area. Visitors to the Dominican Republic should check this new tourist attraction. July 23, 2014 (Punta Cana, DR) – Looking for something to do in Punta Cana? 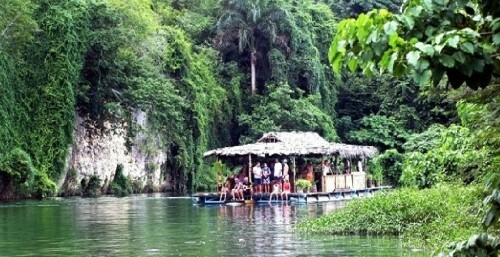 On the banks of the Rio Chavon, the new Tanama Jungle Ranch offers various jungle tours and ecological excursions. Visitors get the opportunity to experience the Dominican rainforest and to come eye to eye with the local wildlife. Weekly more than 60.000 tourists visit Punta Cana and the eastern part of the Dominican Republic. La Romana, just west of Punta Cana, attracts over 250,000 cruise passengers yearly. The new ranch is situated right in the middle of these destinations. Tanama Jungle Ranch is sure to be one of the best up and coming Punta Cana excursions and shore excursion for cruisers arriving in La Romana. The Tanama Jungle Ranch opened on July 1st, and ‘jungle tours’ are offered to tourists in Punta Cana and to the cruise passengers. All Punta Cana jungle tours start and end in Limon (near La Romana) and include a 45 minutes river cruise through the gorge of the Chavon River. Hotel and cruise port transfers are organized by the Tanama Jungle Ranch. Alexander Tilanus, one of the owners, remarked, “Not many tourists know that the Dominican Republic has the most Northern rainforest in the world, and that there are 11 National Parks, each conserving a different aspect of the local biodiversity”. The property is located along the Chavon River, bordering the National Park del Este. The ranch has a butterfly garden, a hummingbird pavilion, a reptile area, and a jungle tour. The Tanama Jungle Ranch aims to not leave any ecological footprint. Power is obtained by solar power and sophisticated grey and black water treatment systems are in place. “We do everything to minimize our impact on the surrounding nature”, stated Alexander. The ranch is owned by Alexander & Marion Tilanus who also own SeavisTour: an excursion operator offering excursions to visitors of Punta Cana, Bayahibe, Juan Dolio and to cruise passengers and by Herman Santana, a local businessman who owns property along the Chavon River near La Romana. More information can be found on the website: http://www.tanamabayahibe.com.